"Threat to social cohesion arising from growing socio-economic inequality is a particular concern, notably in its implications for the younger generations." The Church of Ireland Primate has suggested that one of the contributions the Irish Churches’ Peace Project can make to Northern Ireland is to help it create a public square. 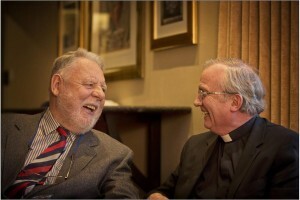 He was speaking during a break in the proceedings of the second day of the international conference hosted by the Irish Churches’ Peace Project in the Hilton Belfast Templepatrick. The Church leaders welcomed the commitment of the European Union to further peace funding, as advocated by the Northern Ireland Executive and the Irish Government. Those who participated at the ‘Faithful Peacebuilding’ conference were Archbishop Richard Clarke, Church of Ireland Archbishop of Armagh; Bishop Donal McKeown (representing Archbishop Eamon Martin), the Bishop of Derry and chair of the Irish Churches’ Peace Project; Rev Peter Murray, President of the Methodist Church in Ireland; Rt Rev Dr Michael Barry, Moderator of the Presbyterian Church in Ireland; and Rev Dr Donald Watts, President of the Irish Council of Churches. In their statement, the Church leaders said their pastoral experience made them “acutely aware that we cannot afford to be complacent about the enduring impact of division in our society, which manifests in multiple, often inter-connected, forms of exclusion”. They highlighted that the threat to social cohesion arising from growing socio-economic inequality was a particular concern, notably in its implications for the younger generations. “As the ICPP enters the final phase of its work we will be reflecting together on how we can continue to build on the new relationships that have been established to facilitate a truly inclusive dialogue about the kind of future we want for our local communities,” they stated. According to Archbishop Clarke, thanks to the work of the ICPP, participants in the project said things were able to happen in the local context that could not otherwise have happened in terms of community work and the Churches working together. “The project actually created space where people could work together where they would have found it very difficult without that project,” he explained. Bishop Donal McKeown explained that there was a recognition that the Churches have a huge amount of social capital, premises, and status in many local communities and that they really weren’t working together as good as they could be. He underlined that the ICPP was not an ecumenical venture but was about dealing with the difficult issues and not being afraid to speak about public issues, whether that be poverty, marriage or war. Rev Dr Donald Watts, President of the Irish Council of Churches, told CatholicIreland.net that the conference and work of the ICPP was about people in local areas dealing with the issues that they see. “This is the grassroots taking ownership and the church leadership is giving them ownership,” he stated. The Irish Churches’ Peace Project, launched in 2013, is an initiative of the island’s four largest churches: Catholic, Presbyterian, Church of Ireland, Methodist; and the Irish Council of Churches. The Irish Council of Churches vision is to build a peaceful and stable society, with a better and shared future. The Irish Churches’ Peace Project seeks to promote reconciliation in communities through the Churches working together for the transformation of Northern Ireland and the border region. The ICPP is a £1.3m programme funded through the EU’s PEACE III Programme which is managed by the Special EU Programmes Body. Additional funding is being provided by the Northern Ireland Executive through the Office of First Minister and Deputy First Minister and by the Department of Environment, Community and Local Government of the Government of Ireland. The project will run until June 2015.